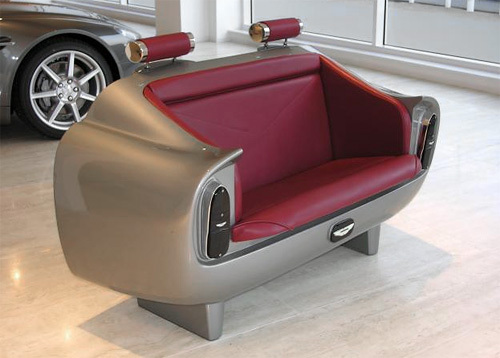 Aston Martin DB6 Couch As Unaffordable As The Car | OhGizmo! By Andrew Liszewski on 02/06/08 • Leave a comment! Let me first assure any Aston Martin fans reading this that no DB6s were harmed in the making of this couch. However, it is an exact replica of the DB6 rear-end so if you do happen to be a big fan of the car, maybe it’s finally time to ditch that futon you have in the living room? The couch is a limited edition made by Aston Martin Heritage Designs, and can be custom ordered in whatever color scheme you prefer. It also comes with an engraved number plate so you always know just how special it is. Of course limited editions and custom order color schemes don’t come cheap, and the DB6 couch will set you back over $7,300. And that price doesn’t even include the matching headrests.